Robyn Molloy is nine years old and barely comes up to her wrestling coach’s elbow but when he calls, she charges in to throw him on the ground. It doesn’t quite work but she just grins and lines up to try again. A dozen kids aged from seven to fourteen come to the Hercules Club in Dublin’s inner city once a week to wrestle. One of the senior boys helps coach Daniel Kennedy with training while older wrestlers lift weights next to the colourful mat. Wrestling was one of the original sports at the Ancient Greek Olympics. Ireland has yet to feature in the medals tally but in other countries wrestlers are given a status far beyond mere athletes. Russian star Alexander Karelin was elected to the State Parliament after retiring from competition. And when Chechnyan wrestler Buvaysar Satyiev won gold at the 1996 Atlanta Games, he used the publicity to draw attention to the war in his country. Most American universities offer wrestling scholarships to entice the best wrestlers onto the school team. But coach Kennedy says the sport is still growing here. “In Ireland we are trying through the schools to get more kids in. About six to eight years is the ideal age for any sport. Not everyone is into soccer or other team sports. I never played a team sport in my life. And wrestling is what some people are into,” he says. He says the hour-long session are different to work he does with the seniors - more playful but strict at the same time. About half tonight’s students are girls but Kennedy says ruefully it’s not easy to convince girls to join. ‘It’s Ok once they get over that they’re grabbing someone and they realise you don’t get hurt. There are very few injuries really, it’s not a violent sport,’ he says. It might not be violent but these kids are definitely getting a good workout. It’s freezing outside but they’re in T-shirts even though the emergency exit door is open to the wind. He coaxes the kids into forward and backward flips before moving onto throws. Jasper collapses in laughter as his throw completely fails to move his partner but Kennedy makes him try again until he gets it. ‘We are freestyle wrestlers, the same as the Olympics. We do get MMA fighters down here now, a lot of their moves stemmed from wrestling. They train with us but not compete, no money in wrestling,’ he adds laughing. Kennedy competed at international level up to the World Championships, and photographs of himself and his brother Keith in action dot the walls. Keith Kennedy is watching the training, explains this group is for Cadets with a few Juniors in the mix, and the later session is for Seniors. The giant mat they’re on takes up half the room – yellow circle on the inside, then red and blue for the outside. Kennedy says wrestlers start on yellow and can gain points by pushing or throwing their opponent onto the blue. The children are barefoot or in socks, but short boots are worn for competition to support the ankles and feet. 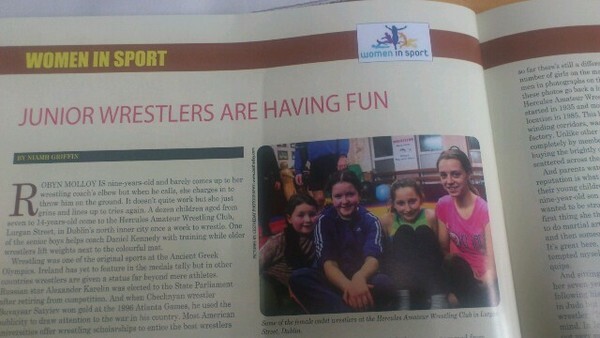 Kennedy says the Irish Wrestling Association is keen to encourage juniors. and stresses how safe the sport is. “They think it’s just fun but they are leaning techniques as they play,” he says, pointing out hidden skills in what looks like a great game of rolling. But wait a minute, isn’t wrestling meant to be about being tough? What’s with all this laughter? “It’s good for them; wrestling gives them the ability to concentrate. And physically it gives them flexibility. Some of the kids go in for competition, that’s different then. When they lose, it’s hard to get their confidence back up again,” Kennedy says. Another coach Mick McAuley chimes in to say they’re trying to get more girls involved. 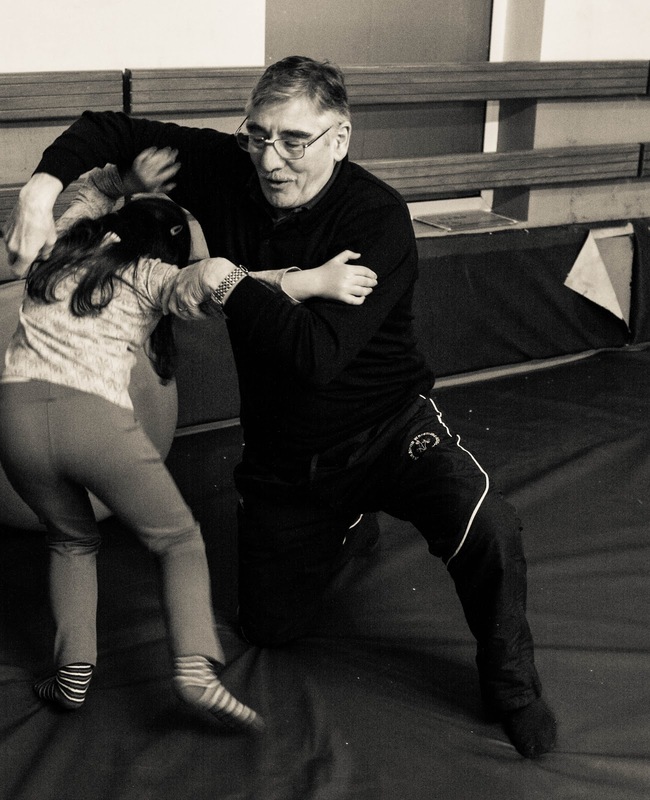 He has two granddaughters out on the mat now, but says they’d love to see more taking up the sport. “Some of the girls say it’s like dancing, they like the flexibility and the agility. The problem is keeping it up as they grow older. Teenagers can feel awkward getting down on the mat with boys,” he says with the wisdom of 40 years in the sport. Kennedy agrees but lists out women who have trained with them and says lots of girls train in judo which isn’t that different. But so far there’s still a difference between the number of girls on the mat and the number of men in photographs on the walls. That said, these photos go back a long ways - Hercules Club was started in 1935 and moved to its present location in 1985. This building with its winding corridors was once a spaghetti factory. Unlike other gyms Hercules is owned completely by members and fees go into buying the brightly-coloured equipment scattered across the floors. And parents watching say the club’s reputation is what brought them here with their young children. Michelle Cahill says her nine year old son Jasper announced he wanted to be strong and wrestling was the first thing she thought about. “He didn’t want to do martial arts. So we looked up wrestling and then someone recommended this club. It’s great here, he’s really happy. I’d be tempted myself but I’m 30 years too late,” she says. And sitting next to her Ingrid says her seven year old boy Samuel is just following his dad. 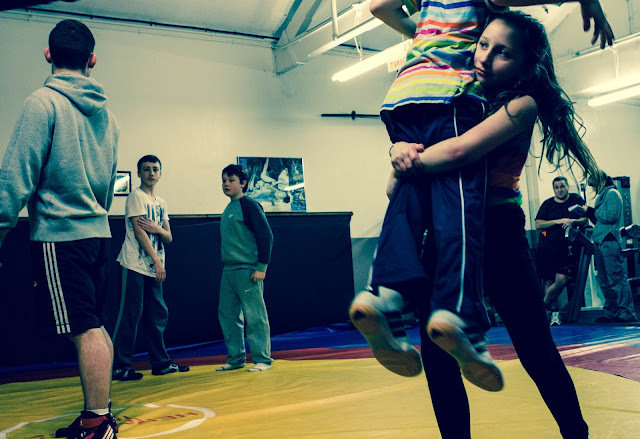 From Slovakia, she trains in Judo but laughs at the idea of being a wrestler. “It’s a good sport for his body and mind. In Ireland it’s growing all the time, it’s not very popular at the moment but it’s growing,” she says. As the children finish their hour, Samuel can be heard calling out: “Coach! One more game?” but as the older students step onto the mat, it’s time for the Cadets to leave. Sitting down to chat, the girls shrug off any aches and pains, saying it’s just part of the fun. Twelve year old Lauren Coffey says she’s been training for almost 18 months already. “Sometimes I hurt my arm but you just have to shake it out and it will be fine. My favourite move is the head-spring. You put your head down and turn into a crab and then flip over,” she says. Her younger sister Eve is here for a trial, her first night. “I’m not tired, it was fun. I love the chasing. I want to come again, but I’ve ballet on Thursdays too,” she says wistfully. Caoimhe Symth (13) says she followed her older brother down one night and stayed. She says: “I love the double-leg. You grab both legs and put them on their back. It’s not really hard. Two of the boys join in with twelve-year old David Scott (yes, another Scott, Clinton’s brother) saying travelling to competitions is great. “I compete for the club; I’ve been round Ireland, and Scotland and Wales. I went to England too. You get medals and trophies,” he says. The boys only talk for a minute, their eyes drifting back to the mat as they speak. And after a few minutes, they take off again to the centre – joining the Seniors with massive grins.